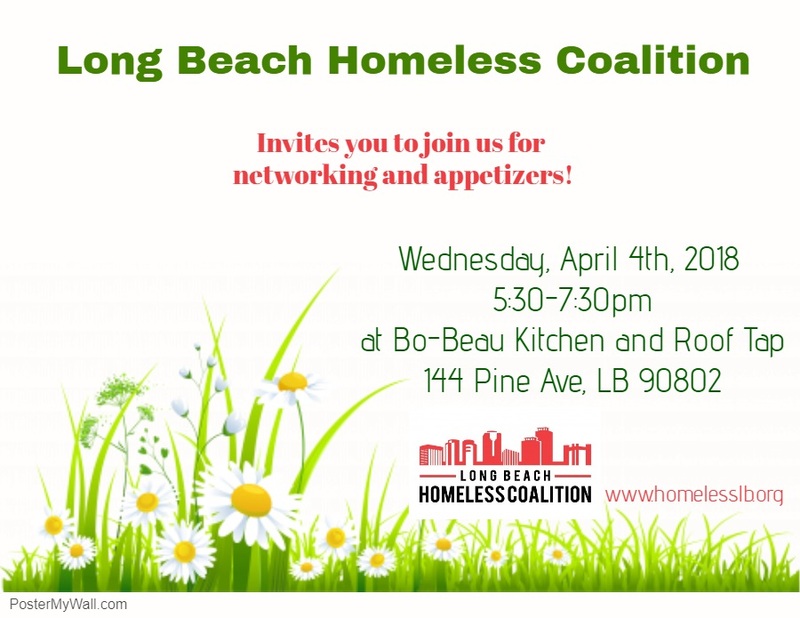 The Long Beach Homeless Coalition is looking forward to our first 2018 Networking opportunity at Bo-Beau Kitchen + Roof Tap. As part of our mission, we want to provide our partners and members with opportunities to learn about other programs and each other so that we can better work together to address homelessness in Long Beach. In place of our morning general meeting on April 4th, we will be hosting appetizers and snacks at Bo-Beau from 5:30-7:30pm. We look forward to you joining us. The regularly scheduled meeting for April will not be held. Our next general meeting on May 2nd will take place at the Multi Service Center (MSC) at 9am and will include a tour. The MSC is located at 1301 W. 12th St, Long Beach, CA 90813.